My name is Patrick Boyle; I am a thirty-five year veteran of the Philadelphia Police Department. 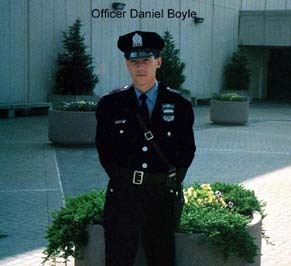 My son, Daniel Boyle, followed in my footsteps into the Police Department in February 1990. On February 4, 1991, Dan was working the 12:00am to 8:00am shift. At about 2:40am, Danny stopped the operator of a stolen vehicle, the perpetrator jumped from the auto and began firing at least 15 shots at him, one of those bullets struck Danny in the right temple. Danny died of his wounds on February 6, 1991. He was 21 years old. The Officer Daniel Boyle Scholarship Fund was established at Dan's Alma Mater, Archbishop Ryan High School, in order to keep Dan's memory alive and to assist as many families as possible in the education of their children. To date, the fund has been successful in assisting over 220 students with their tuition payments. The fund is based on the financial need of any family, without regard to race, religion, or natural origin. This year, we have expanded the number of schools that we can assist. Included with Archbishop Ryan High School are Monsignor Bonner, Cardinal O'Hara, Cardinal Brennan and Roman Catholic High Schools.